Vanilla or Rum and Coconut Ice Cream. Sift 100g plain flour, 1 tbsp light brown sugar, 1 tsp baking powder and a pinch of salt together in a large bowl. Stir in 1 tbsp desiccated coconut. Add 100ml water and 1 large egg and whisk until the batter is smooth. Peel 4 ripe plantains (when ripe, the skin will be largely black and the flesh will be soft). Cut them into 1cm-thick slices on a slight diagonal. Heat a 1cm-depth of vegetable oil in a heavy frying pan over a medium heat until a blob of batter dropped in the oil rises to the surface, bubbles and starts to brown. Coat the plantain slices with batter and fry them in small batches (don't crowd the pan) until they are golden brown on both sides (about 45 seconds each side). Use a slotted spoon to transfer the fritters to paper towels to drain. 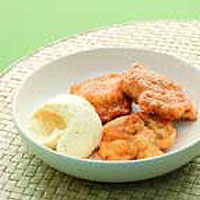 Dust with icing sugar and ground cinnamon and serve the fritters hot with a scoop of vanilla or Hill Station's rum and coconut ice cream.